That word covers a lot of territory, from Casper the Friendly to Hamlet's father, from trick-or-treat bag white-sheeters to the really scary ones in literature, cinema, and legend, to say nothing of reports of reputedly real hauntings. One of the fundamental decisions that confronted the Imagineers who put together the Haunted Mansion was choosing which ghosts and ghoulies to put before the public. It was like writing a recipe. 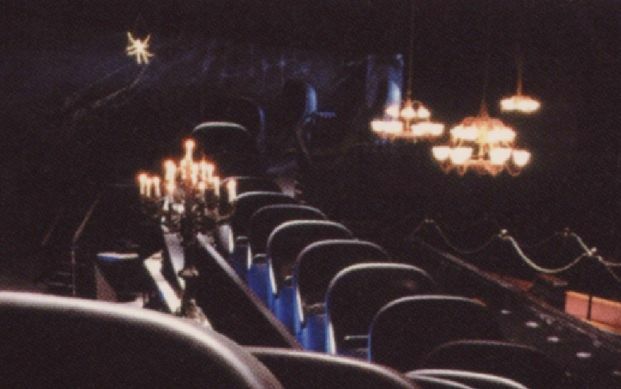 How much should the Mansion rely—if at all—on cinematic ghosts? or Halloween decoration ghosts? or established dark ride traditions? 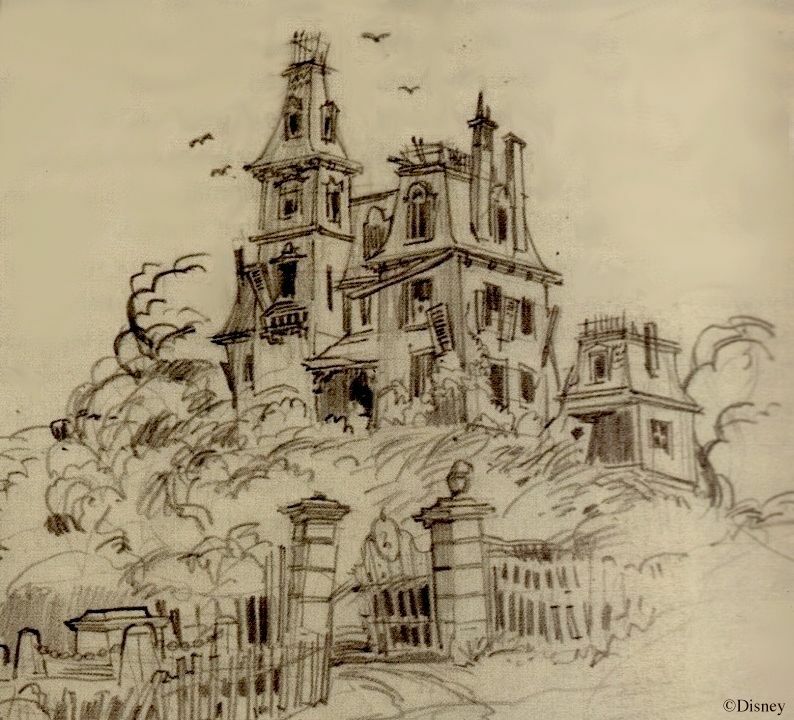 The long gestation period of the Haunted Mansion and the conflicting concepts proposed by the many Imagineers who worked on it ensured that the recipe for the attraction would go through many permutations before it was finalized. 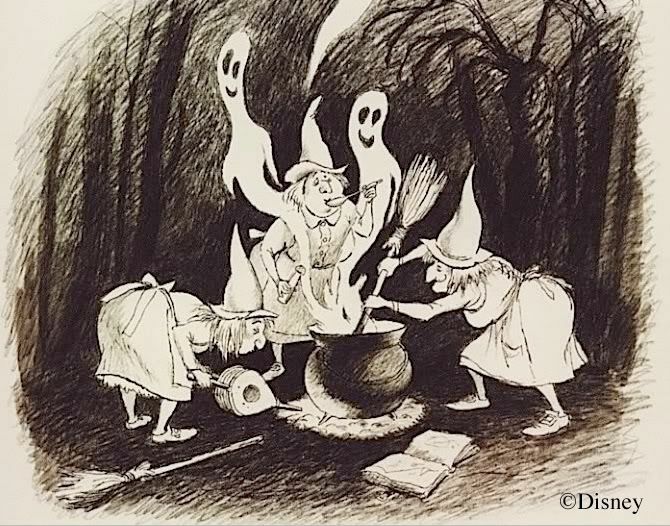 But Marc Davis's famous verdict to the effect that this particular broth was spoiled by too many cooks is refuted by the ride's growing and often passionate fan base. Mmm-mmm good. Mighty tasty, that recipe. This post takes a look at some of the approaches they seriously considered but eventually rejected, and why. 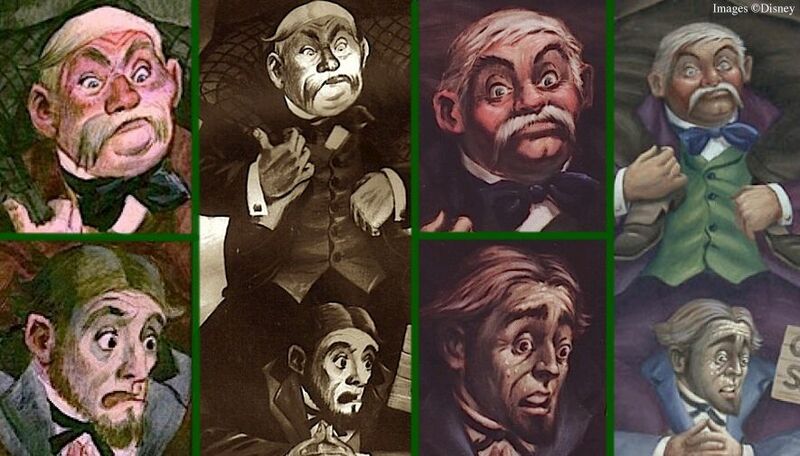 Curiously enough, for anyone who is interested in this topic, there is a set of paintings that serves almost as an index of the Mansion's disused and discarded concepts: The "Sinister 11" portraits. These are found at WDW and Tokyo, but they were never used at Disneyland. 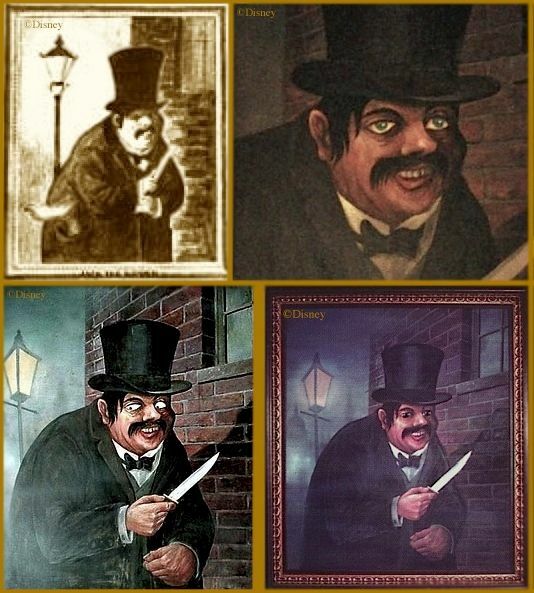 I'm sure that many of you are already aware that most of the Sinister 11 represent unused ideas for changing portraits. 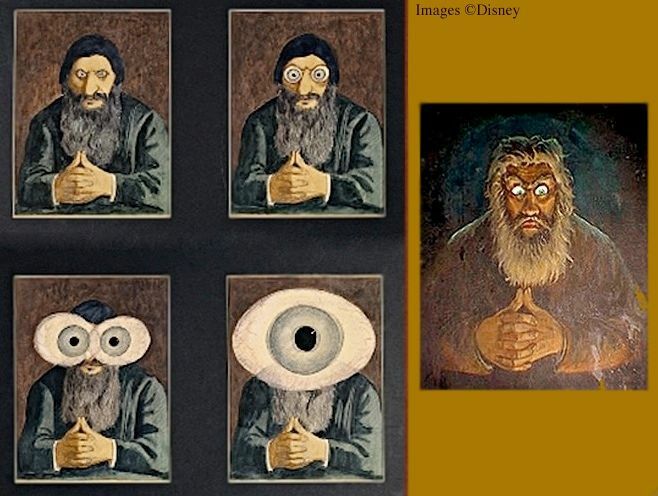 Two of them did indeed become changing portraits at DL (Medusa and "December" from the April-December set); the rest became static paintings with "follow-you" eyes. Until 2007 at WDW they were all in a nice neat corridor. At Tokyo, that's still so. Since 2007, most of the Orlando set can be seen in the load area, with a few placed elsewhere in the ride. However, they no longer stare at you as you go by. It's interesting enough to discover that many of these are really truncated changing portraits; it's even more interesting (to me, anyway) when you realize that they are, in several cases, signposts pointing to paths not taken. Take Jack the Ripper. He has the distinction of being—possibly—the ONLY fully historical figure in any of the Mansions. 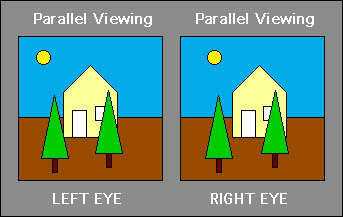 are from the eyes-follow-you days, an effect made possible through the magic of half a ping pong ball. I say "possibly" because it has been pointed out to me by one of our readers that the Knight changing portrait was labeled "the Black Prince" on Marc Davis's original sketch, as GRD noted years ago. If that refers to Edward, the Black Prince, then we have one other historical character. What about "Great Caesar's Ghost"? Sorry, he doesn't count, because it's uncertain which Caesar he is. No doubt he's either Julius or Augustus, but since it isn't specified, he's technically a generic figure rather than a historical figure. Same with the Mummy. He's frequently referred to as King Tut, but without a scrap of evidence. 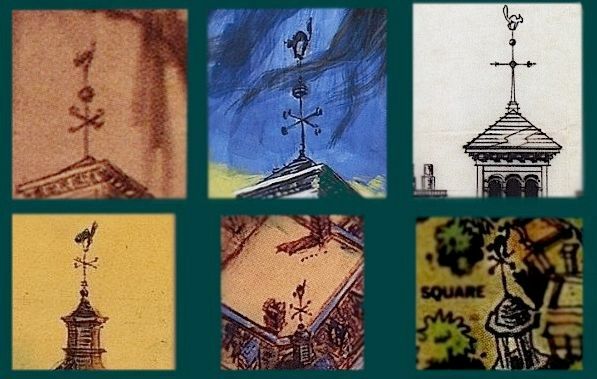 Jack is all that remains of Ken Anderson's and then Marc Davis's ambitious plans to use a variety of colorful historical villains in the Mansion. Ken's 1957 show scripts included Anne Boleyn, Lucrezia Borgia, Anne Bonny, Jack the Ripper, and King Tut (not really a villain, of course, but fully historical and . . . sorta creepy). From that list, Marc kept Anne Boleyn . . .
. . . and Mr. Ripper. 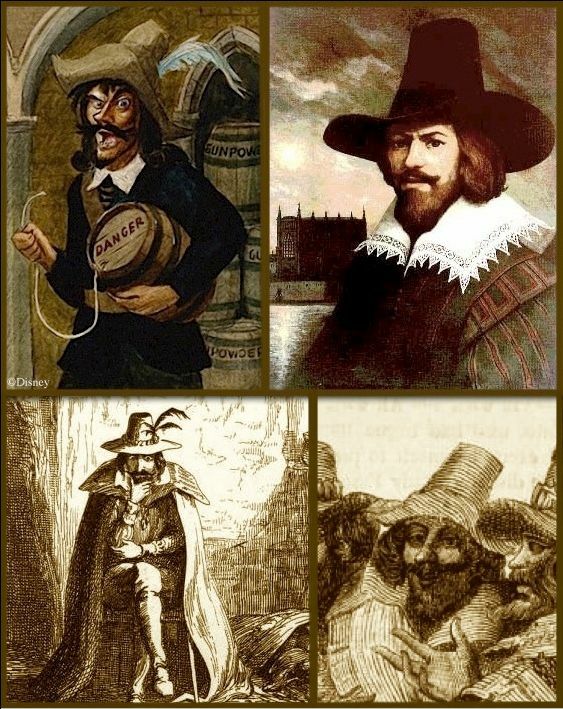 He also added a number of historical villains of his own, including Guy Fawkes and Ivan the Terrible. (By the way, these were not going to be changing portraits but talking portraits, I am told.) As an aside, it's always fun to speculate about the models Marc may have used in drawing his sketches—in these cases caricatures of historical figures. a famous caricaturist previously mentioned in our discussion of the Phantom Drummer of Tedworth. It's very likely that Davis knew his work. In the present case, note the feather in the hat. contribution. 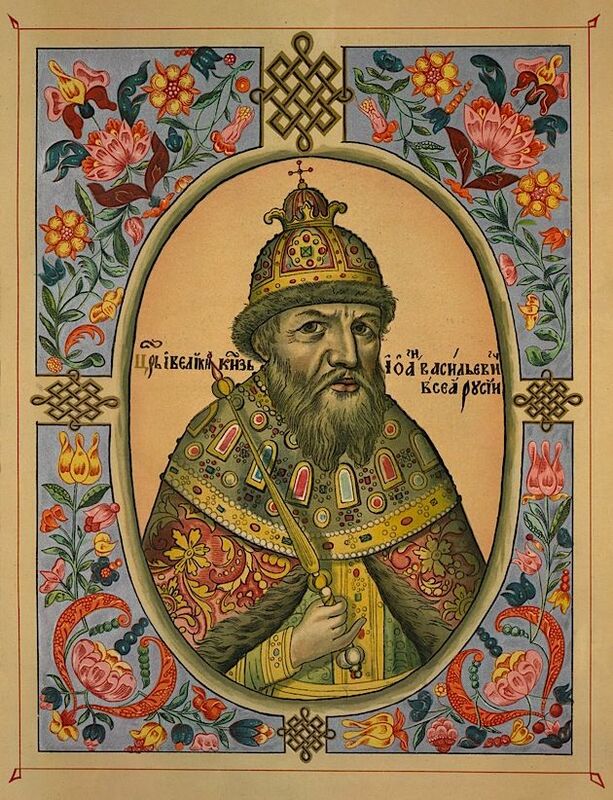 I kinda doubt it, but then again, there's that helmet-like crown, so maybe . . . .
Marc also planned to use Rasputin. Believe it or not, Walt nixed this one himself, not because it was so weird but because he feared that relatives of Rasputin might still be alive (which was true) and might want to sue them! 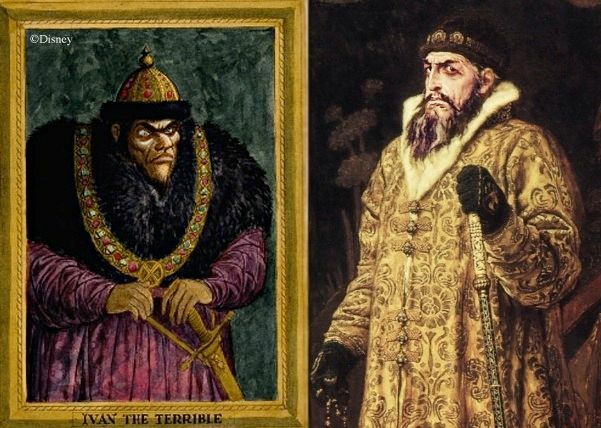 Marc recycled some of his unused Rasputin portrait into one of the Sinister 11, the one sometimes referred to as "the ogre." As for Marc's inspiration, who knows? 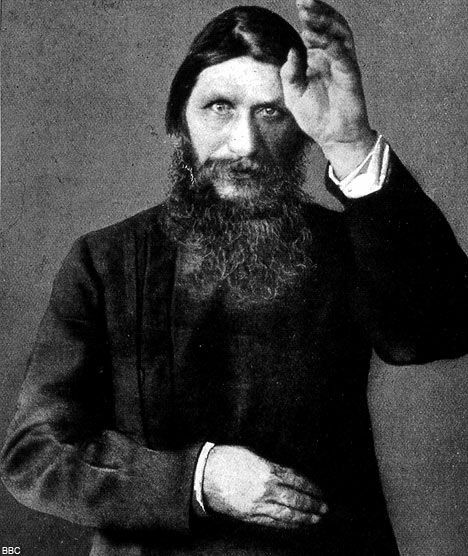 I mean, when doesn't Rasputin look like that? 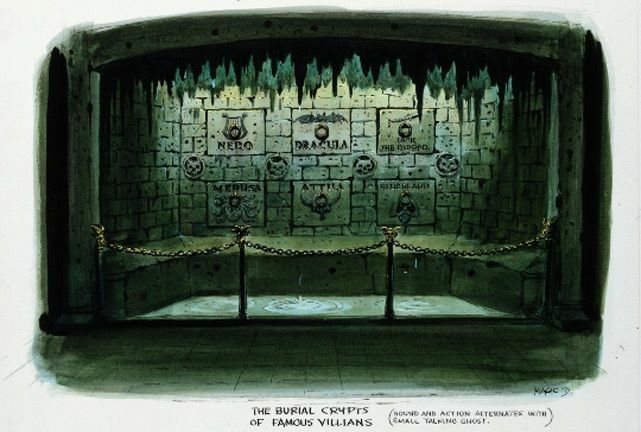 Marc was still open to this approach at the time they were planning Tokyo Disneyland, and he did a concept sketch showing an animated crypt full of "famous villians" [sic], including Nero, the subject of a Davis sketch GRD got hold of. Maybe the concept was for him to be a talking, moving statue. 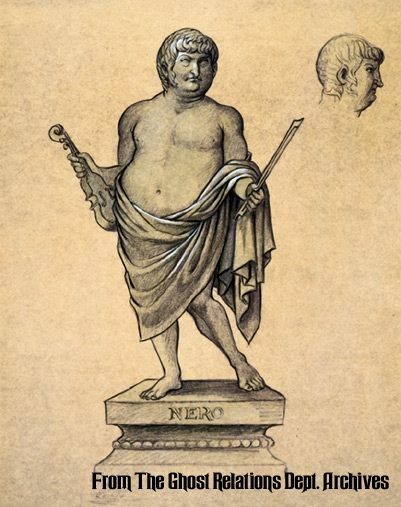 Nero, that is, not GRD. Whatever it was, this too came to nothing. In the end, only one or two historical characters survived the sifting process. 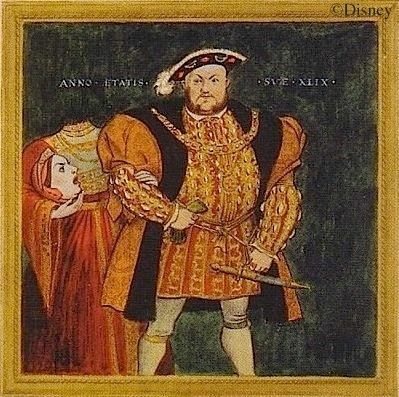 And at Disneyland, there is no Jack the Ripper portrait, so Edward, the Black Prince is all you get in the Anaheim original. Upper left is the ride version, complete with ping pong balls. Upper right is some impressive concept artwork.  Lower left, another example from the Sinister 11. But as usual, Davis proposed a few such characters of his own. 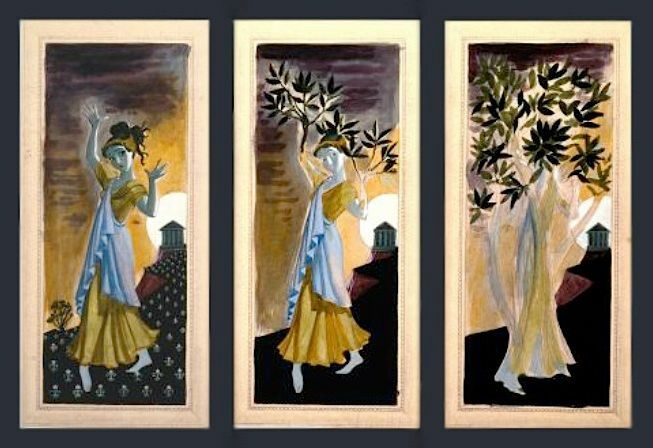 A couple were from classical mythology. 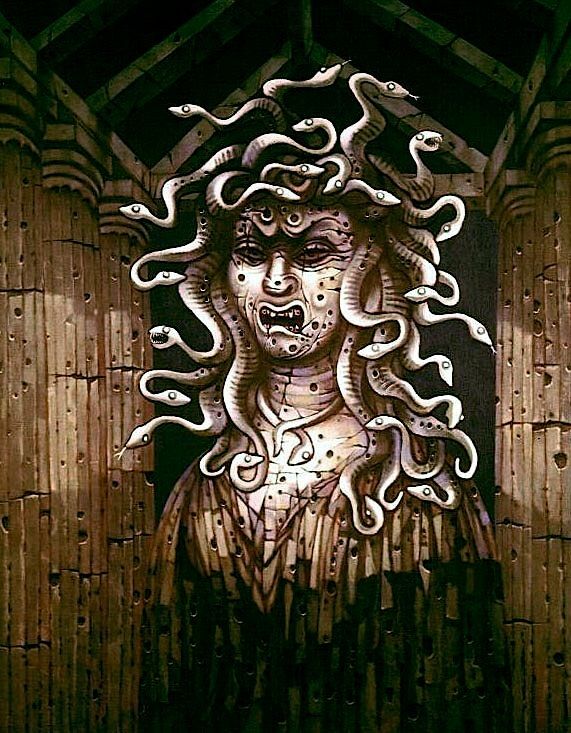 There's Medusa, an original changing portrait at DL (as she is also now at WDW) and an original Sinister 11 member at Tokyo and WDW. Just as the Sinister 11 "ogre" is actually a recycled design based on an unused Rasputin changing portrait, so also the S 11 "arsonist" is based on an unused changing portrait, this one depicting a wolfman. It's not clear whether Marc's wolfman owes anything to cinematic or literary archetypes. The same is true of Dracula, actually. In fact, you cannot find any indisputable case of borrowing directly from the movies to provide a specific character for the Mansion. 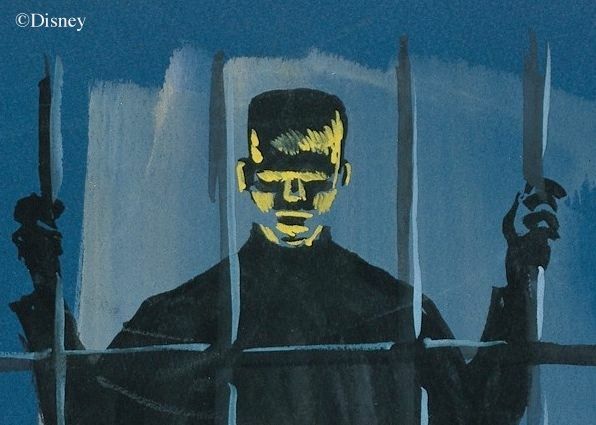 The only example of this I can find anywhere in Mansion concept art is Ken Anderson's Frankenstein, which is obviously molded in the moldy mold of Boris Karloff. We need to mention again the following, even though it's a Poe example of the phenomenon. Once upon a midnight dreary, characters and images from Edgar Allan Poe were going to enjoy a conspicuous presence in the HM, as we've seen in a previous post. The Raven's dialogue was replete with "nevermore's," and a demonic, one-eyed black cat was going to pester you all through the ride. But the Poe allusions were eventually taken out of the mix. So are Dracula and Medusa really the only direct borrowings from literature and/or cinema that made it into the Mansion? Almost. 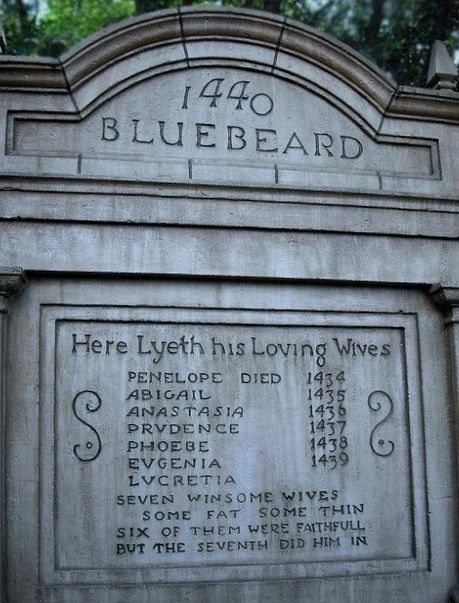 You've also got the Bluebeard crypt. But yeah, that's about it. 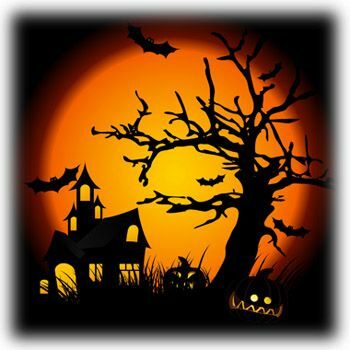 We find the same story yet again when we turn to the campy, hokey, orange-and-black world of Halloween iconography, another obvious source of ghost and haunted house lore. Ken Anderson also dipped his pen into this inkwell a few times. One of his scripts called for a marriage between "Monsieur Bogeyman" and "Mlle. 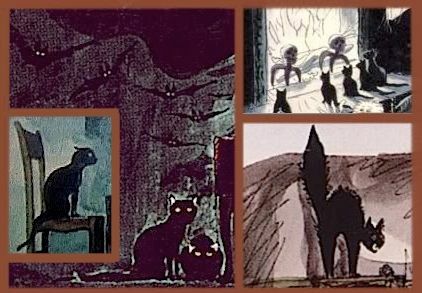 Vampire," and his sketch of the mansion exterior had an unmistakably Halloweenish black cat weather vane on it, faithfully preserved by Sam McKim and Marvin Davis in subsequent artwork and only traded in for the familiar schooner shortly before the final blueprints were drawn up. 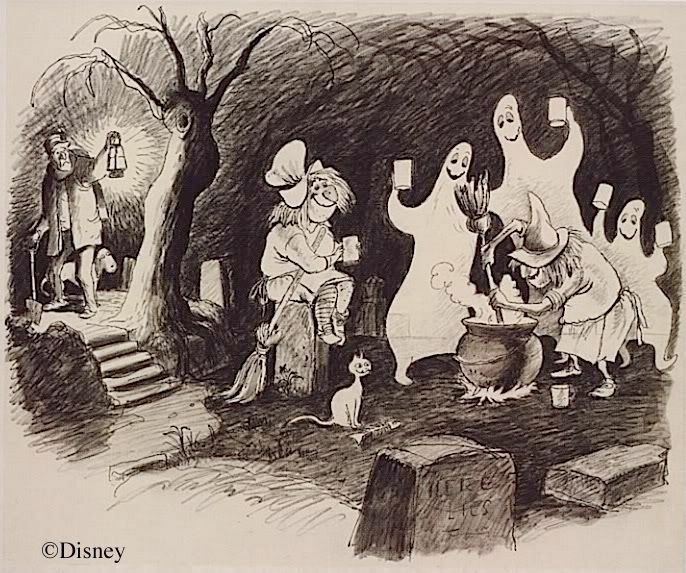 But it was Marc Davis who showed the most inclination to exploit Halloween iconography. It's not known whether he just changed his mind about this approach, or if other Imagineers helped him see the error of his ways. In a previous post, we saw that Davis apparently had a difficult time with the seemingly simple notion of putting a witch into the Haunted Mansion. He veered back and forth between a "real" Black Sabbat type of witch and a Halloween decoration witch. The "Witch of Walpurgis" (among the Sinister 11) remains the only witch in the HM, a compromise between the two approaches. Marc also persisted for a long time with the idea of using stereotypical white sheet ghosts. Like the witches, they're something right off of a trick-or-treat bag. Marc carried this approach toward realization surprisingly far. 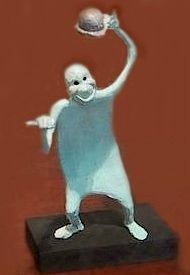 One of his hitchhikers ("Ezra") still had that icky "Casper the Friendly Ghost" look when he was done up as a maquette. Of course, it's easy to dump on it because we all know that what took its place is so amazingly good. 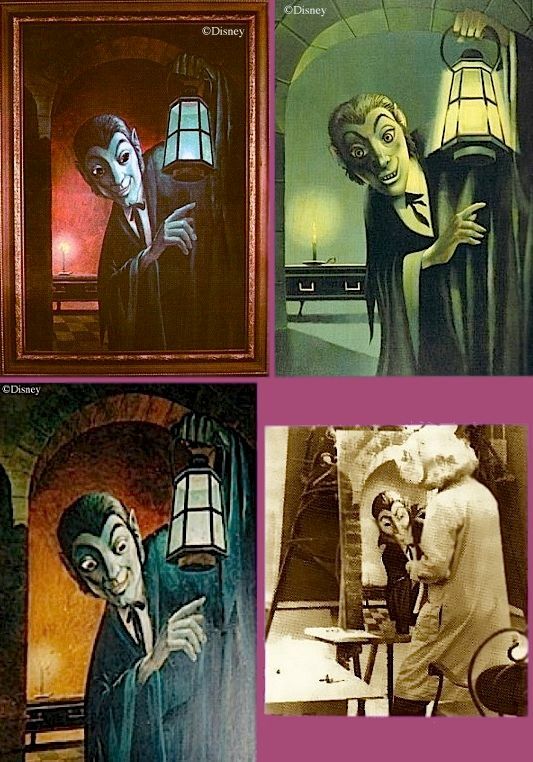 cats that survived into the finished Mansion are to be found—surprise!—in a couple of the Sinister 11 portraits. 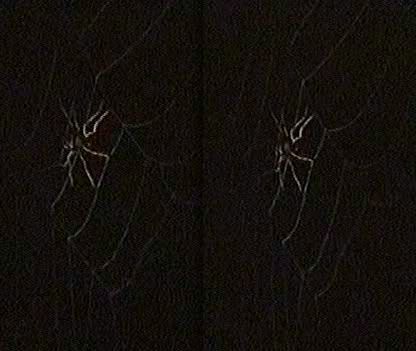 A few notes on the spiders: They originally had one of these orange guys in the big web of the DL "Limbo" load area through which the doombuggies descended (which web has been gone since about 2001) . . .
. . . . but they eventually changed it to a more realistic color scheme. 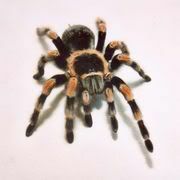 I think it's a natural law: all giant spiders gravitate toward the Mexican Orange-Kneed Tarantula look (you know, the one you always see in the movies). The original orange giants persisted at WDW until 2007 in the area now occupied by the "Escher" staircases. their legs, which is cool. If you really must do the giant spider thing, that's the way to do it. After this post was already written and in the can, lo and behold FoxxFur decided to take up the topic of Disney's giant spiders. That's karma for you. 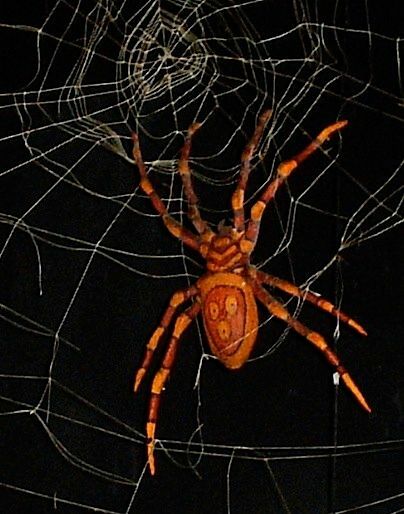 Anyway, if you want to explore Disney's arachnophilia further, check it out. 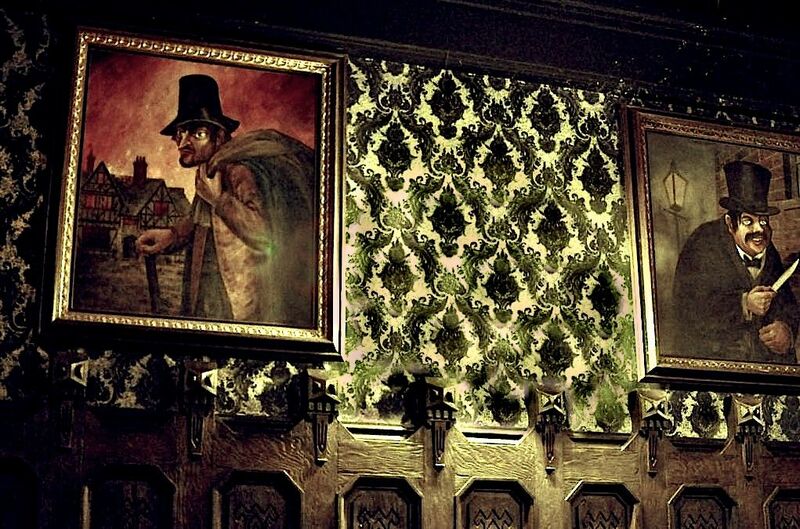 To sum up our study so far: All that is left of specific historical characters in the HM are the Jack the Ripper and (probably) Edward, the Black Prince portraits. 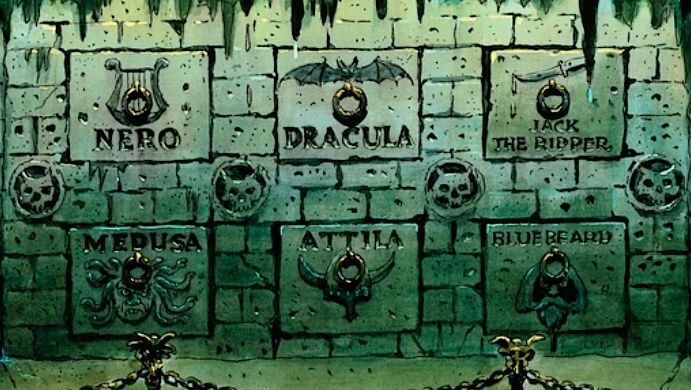 All that is left of specific literary, mythological, and cinematic characters are the Dracula and Medusa portraits and Bluebeard's crypt. In the style and manner of Halloween decor, all that is left are some giant spiders at Tokyo—assuming that is a valid categorization for them in the first place—and probably the bat weather vane at WDW. Hey, how about traditional dark ride phantasmagoria? Didn't they consider that approach? Well, there are the popup ghosts, of course, widely understood as a hat tip to the HM's dark ride roots. You know, it may be possible to tip our hat to something more specific than "dark ride roots." Most of the HM graveyard popups pop up from behind tombstones (as above, right). 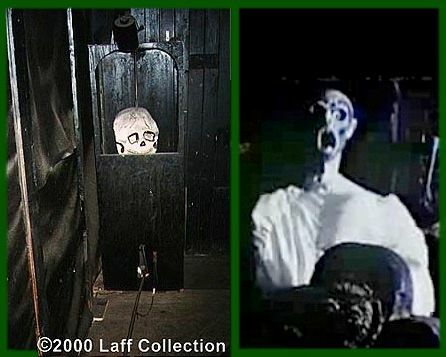 As it happens, exactly this stunt can be found in The Haunted House, a dark ride at the Boardwalk in Ocean City, Maryland, run by Trimper's Amusements. It dates to 1964. 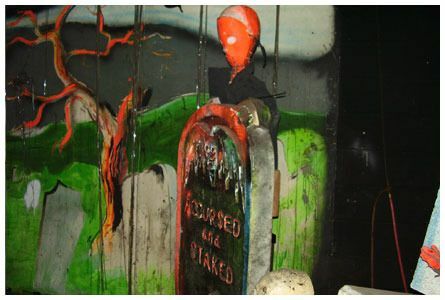 The resemblance could be coincidental, of course, but it's worth noting that The Haunted House is a Bill Tracy spookhouse (one of only a handful still operating). 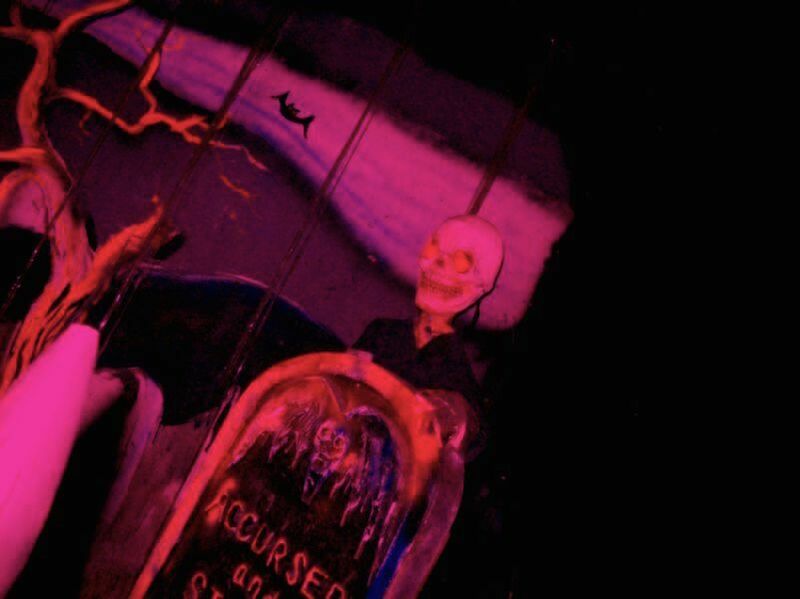 We discuss Mr. Tracy's dark ride contributions elsewhere, so suffice it to say here that he was an acknowledged master of the genre, and it's likely that his rides were researched by the HM team. 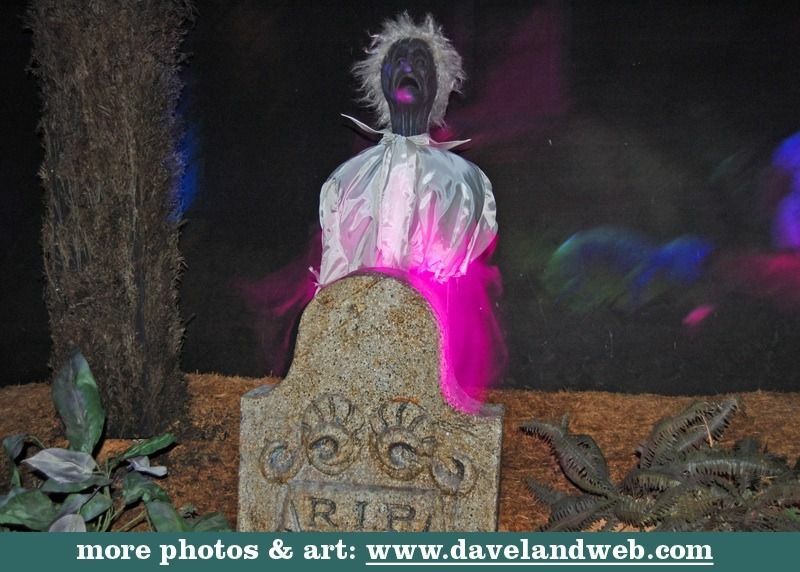 It's also quite possible that the popup-spook-behind-the-tombstone stunt was used in other Tracy dark rides as well. Once he got into his groove, he tended to stick to a tried-and-true menu of tacky tableaux. 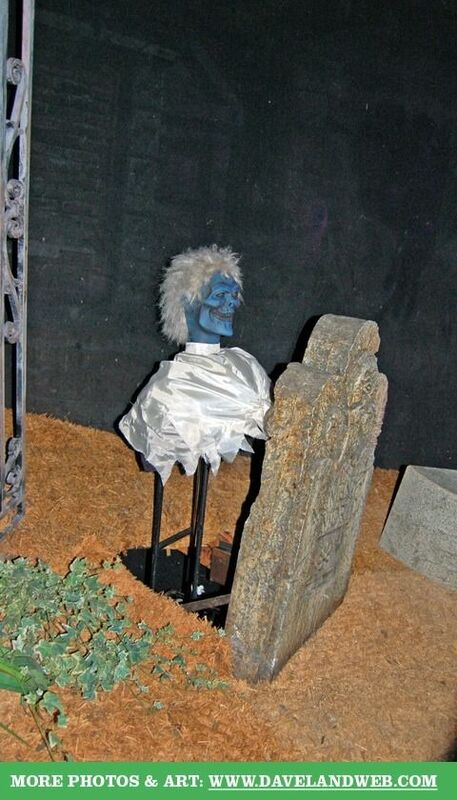 Some would argue that the coffin guy is an adaptation of the coffin popper, or "Dead Dan" gag, a spookhouse perennial. That's probably valid. Maybe the hanging corpse. 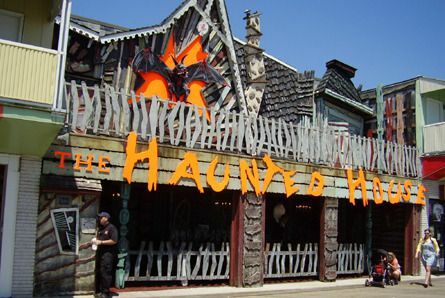 Beyond that, I don't see much reliance on the haunted house dark ride tradition. 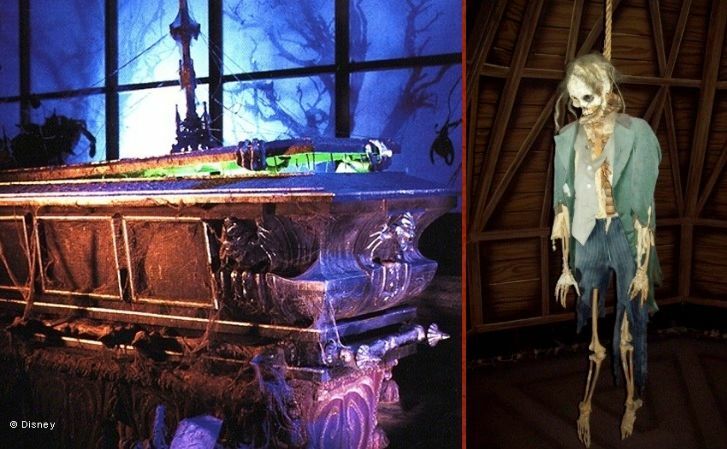 However, in contrast to the approaches discussed above, I don't know that the Imagineers ever planned to use the spookhouse template further than they did, so it probably doesn't belong in a discussion of approaches that have left a smaller footprint than originally contemplated. Time for the big "so what?" moment. Goodness knows, you've been patient long enough. What is the common thread running through all of these ultimately rejected approaches? 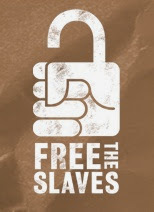 All of them betray a basic insecurity, an attempt to borrow scare credentials from pre-existing, pre-packaged sources. In rejecting these approaches, the Imagineers voted for originality. 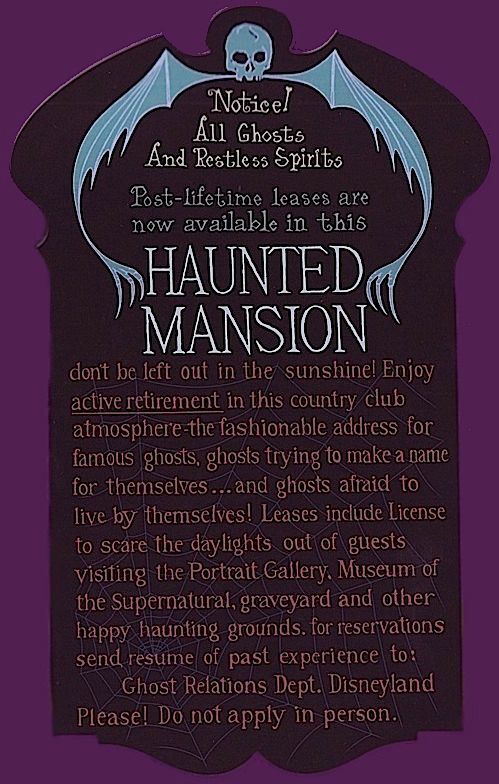 The Haunted Mansion would stand on its own two feet, or it wouldn't stand at all. 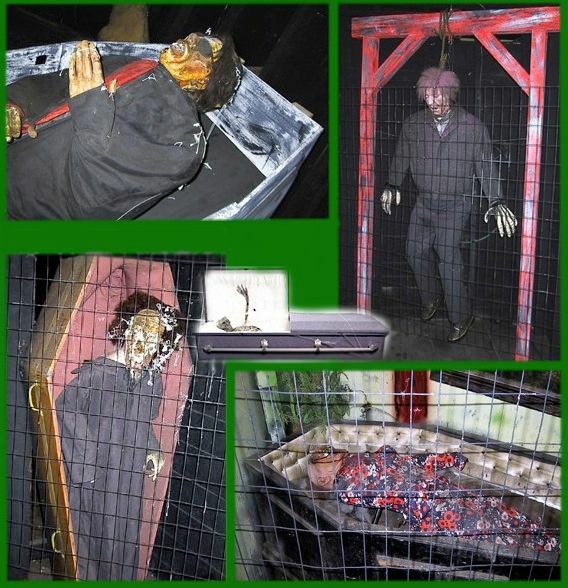 No shortcuts, no quick and easy goosebumps by putting a Frankenstein monster in there or having a Pit and the Pendulum scene. We have done a lot of posts ferreting out ghostly inspirations in myth, literature, and history for such things as the attic bride, the graveyard band, the hearse and coachman, the decapitated knight, and the mummy scene, just to name some of the more interesting ones. In every case the inspirations are inspirations only. The Mansion characters themselves are originals. After 40 years, they've made their way into the popular cultural consciousness, and you can speak of Madame Leota or the Hitchhiking Ghosts in the same breath as Frankenstein or Dracula, so familiar are they. But at one time, they represented a creative risk. In other words . . .
"famous ghosts" in favor of "ghosts trying to make a name for themselves." Following up on the Tightrope Walker post, it seems only fair to give the other portraits the same treatment. The differences in artistic interpretations of these characters are at least as noticeable as was the case with Ally Gal, and in some cases they are even more dramatic. Here's Connie (née "Abigale Patecleaver," her name in that same old X. Atencio script cited earlier). 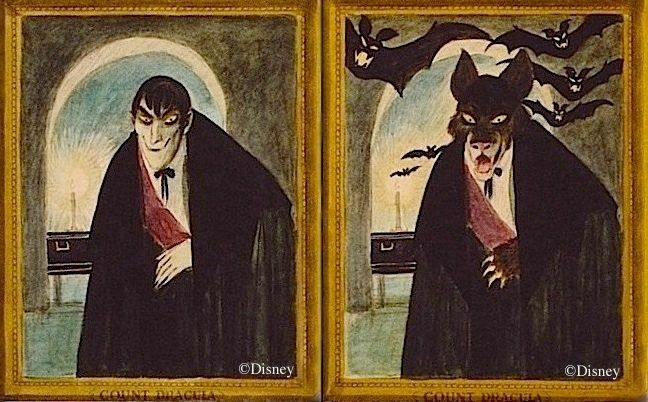 Left to right we've got (1) Marc Davis's original sketch, (2) a Davis-style canvas actually used in the attraction during the first year or two, (3) Clem Hall's version ca 1982, and (4) the current DL version. We'll use that formula with the other characters as well, displaying the same four representations in the same order. The first thing I always notice about Marc's original is that this widow is not very old. She's put on a few, but she's still cooking on all burners. Secondly, there's a huge contrast between the fried-egg madness in the eyes of Marc's Tightrope Walker and the nimble intelligence of this widow. If this is madness, it's an utterly different form of madness. This is truly a classic Marc Davis sketch, in my opinion. The self-confidence is there, the cold-bloodedness, the wicked edge. She seems quite pleased with herself. She keeps her secret without a trace of guilt feelings. And check out the colors in that face! Yellow skin, grayish-green shadows, pink ears—and yet, mirabile dictu, she doesn't look sickly but very much alive and well. Unless someone had called your attention to it (like I just did), would you ever have noticed how daring and original Marc's palette is in this sketch? As I pointed out in the Ally Gal post, the first stretching portraits tried to retain the Davis drawings, but they "naturalized" the colors. As was the case with Ally Gal, the widow done this way isn't nearly as good. And don't think Marc didn't notice the way they trashed his color scheme. During an interview with Alice Davis during one of the 40th Anniversary events in 2009, she lamented that many of Marc's gags were either not used or were "overloaded." Interviewer: "But a lot of Marc's stuff is still in the Mansion, with—like the stretching portraits, and things like that." Alice: "Yes, but they're not his. They're somebody else's, and the color is not as, uh, nice as what Marc's or Mary Blair's would be to the eye." When we get to Clem Hall's widow, we have a real revolution. She's quite a bit older. She's drunk. She's got a droopy, somewhat vacant look as a result. 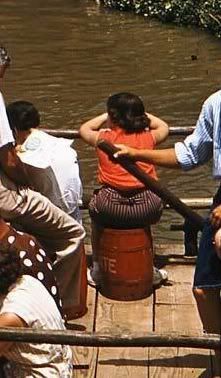 But she's still got a few essential qualities remaining from the Davis original. She's smug and self-satisfied. She knows something that you don't know, but that woozy look keeps her from looking pompous about it. You suspect that there's definitely something going on in there when she's sober. Marc's original Dynamite Guy looks like a leftover pirate from POTC, and I mean one of the mean ones. Look at those beady eyes. This is a look of undisguised cruelty and barely-suppressed rage. The colors are much more natural this time, so the canvas version is not such a radical departure. Very little difference, except that the eyes have been softened. With those pretty blue peepers, you're tempted to think that maybe, just maybe, this guy started out in life as a nice little boy and turned bad at some point. Davis's original, on the other hand, was born bad. Clem Hall, once again, reinvents the character. This guy isn't evil or angry (let alone crazy or drunk); he's just plain stupid. It's a study in pride and vacuity. The more you look at him, the more convinced you are that he hasn't had an interesting or intelligent thought in his life, but that apparently hasn't kept him from becoming a Somebody. Are those eyes gazing unfocused at something in the distance, or are they gazing inward at the void where his soul should have been? Seriously, if you were told that this is a painting of a blind man, you might well believe it. What we have here is a smug toad. He's self-satisfied and superior, but he's not threatening, not particularly vicious. Alas, I have no color photo of the Davis-like canvas, so we are at a disadvantage there, but it looks like they botched the shape of his face a little. The smile is not as broad, the cheeks don't bulge out as they should. Something is definitely lost in that part of the face. Once again Clem Hall, it seems to me, has given us a drunk. Nose and cheeks are red, eyes are pale and watery. He's feeling no pain. It's another study in vacuity. Those eyes are staring out at the world unseeing. Remember the overall message of the stretching portraits? The things most highly prized in this life are mere vanities that only serve to distract us from the reality of death. That is what many would call a "sobering thought." With Hall's characters, the state of mind untroubled by that sobering thought is represented, quite naturally, by what looks like an alcoholic haze. As usual, the current version has sobered up the subject considerably, and as usual it has failed to fill the void with anything particularly interesting. The remaining Quicksand Men are of less interest, since by the time you see them the joke is beginning to unfold. As the ironic distance between the smug upper portrait and the macabre reality beneath diminishes, so also opportunities for artistic reinterpretation of the joke diminish. Not surprisingly, then, the post-Davis versions don't reinvent the two lower Quicksand Men very radically. The middle guy has only just now spotted the quicksand sign and has only begun to realize his dire situation. You see pure shock in his face. Even in this moment, he still has his sense of self-importance with him. It's not, "This can't be happening!" so much as "This can't be happening to me!" The bottom guy is past that. He's been aware of the situation for several seconds by now. Initial panic has turned into a full comprehension of the inevitable. Hall et al have added sweat droplets to Davis's original. Hmm. Is that the hot sweat of exertion or the cold sweat of terror? 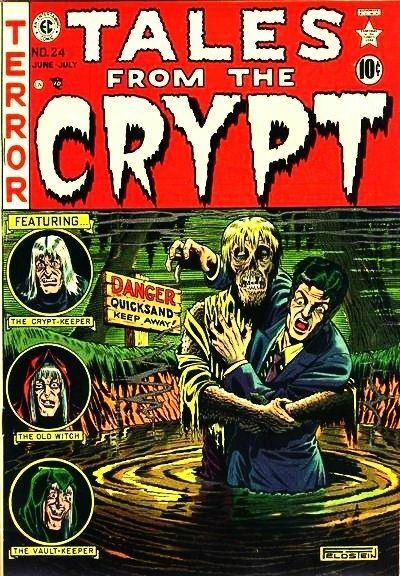 On a lighter note, we discussed in an earlier post the evidence that Davis looked through old EC horror comics for inspiration from time to time. Seems to me there are enough elements in common between this Al Feldstein cover art and Davis's Quicksand Men to raise suspicions. On the other hand, there is no need to go rummaging through old comics in search of inspiration for the basic gag in the Dynamite Guy portrait. A plausible source can be found right under our noses, mere yards from the Mansion.